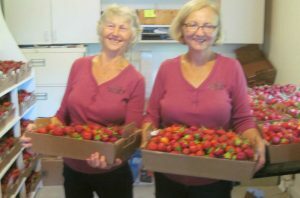 I really enjoyed interviewing Sarah and Alinda on KWLM and then traveling to the farm and meeting Dan and the rest of the family at Brouwer Berries. You have a wonderful family and a first class operation and this year's strawberry crop is tops!! Back in 1998, Dan casually mentioned to me that he’d bought a few strawberry plants. “How many,” I asked, somewhat distractedly. “Fifteen hundred,” he replied. At this point, my eyes jerked open, and I started spluttering. “What on earth for?” He explained that he and his mom were going to start a strawberry U-pick farm, but he was sure it wouldn’t affect me in any way. 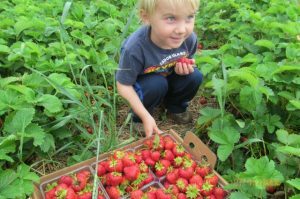 Since that time, a wonderful mix of people of all ages have come strawberry picking at our farm, Brouwer Berries, just eleven miles west of Willmar. We continue to grow in acreage to meet the rising demand for locally grown fruit. Everyone who comes eagerly joins in the harvest experience. A field-fresh strawberry tastes fantastic! 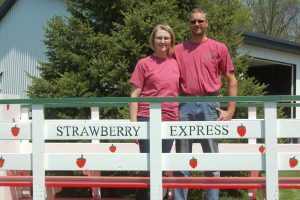 By 2013, we still had only one acre of strawberries each summer, and we were selling out within a few minutes of opening each morning. We realized we needed to either grow our field size or get out of farming. We decided to grow. This has meant digging a second irrigation pond, placing drainage tile under our fields, getting a bigger tractor and storage barn, and dedicating hundreds of hours each summer to weeding. We also desired to find ways to replenish our soil without using chemicals. 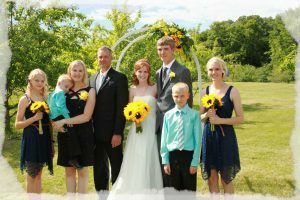 Dan and I both enrolled in a soil biology program through the state of MN, and Dan spent hours on youtube researching cover crops and cattle. We now have a small herd of cattle that Dan moves every night during the growing season to maximize their impact on our soil. 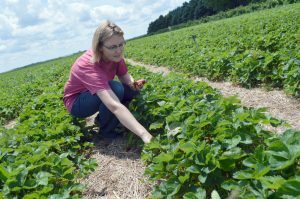 We are excited about the ways this improves our soil biology, which will improve our strawberries. The Department of Ag is impressed with our commitment to natural farming, and has awarded us with repeated grants to improve our livestock facilities and study sustainable methods of farming. 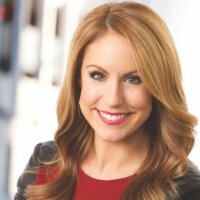 They have also sent out groups of other interested people to observe our methods. 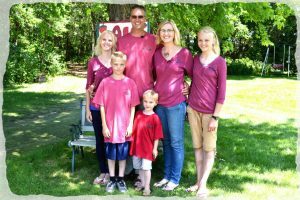 Dan and I have five children who have grown up participating in the rhythm of life on a strawberry farm. They each get to help with all aspects of planting, harvesting, directing customers, and endless hours of weeding. Our parents, including my parents who come from Canada every summer, help out during the busy harvest season with sorting the fresh fruit and driving the tractor. They tell us it is fun! What a blessing it has been to raise our children on the farm with so many opportunities to develop new skills and to welcome hundreds of new people to our farm each year to participate in the joy of the harvest. Perhaps this year I’ll get to meet YOU, the dear reader who is taking the time to read about our farm. You wouldn’t have read this far unless you care about the land and the people around you, which makes you, like our berries, pretty special. I look forward to seeing you on our farm, and even if I don’t get to greet you personally, please know that I am thankful you came, and that I hope you have great joy in the harvest experience.